If you don’t follow me on Instagram, you may not have seen my updates from Me Made May so far, so here’s a quick collage of what’s gone on outfit-wise. What have I learnt so far? Despite saying it almost every year, I really don’t own a great deal of me-made basics. Most of my basic items were either bought before I began the pledge or are second-hand. It’s partly because basic items don’t feel as fun to sew, perhaps? If anyone can recommend some great basic sewing patterns in the comments below, that would be great! Also finished a new skirt today, hurrah! Though I did manage to stab myself with the seam ripper. Boo. How’s Me Made May going for everyone else? And in case you missed it, I wrote a blog post for work about the challenge. You can check it out here. It’s the price we pay I’m afraid lol!!! I find the basics I reach for most often are knit dresses, usually from cake patterns. Tiramisu, red velvet. Renfrew tees and Kelly skirts are also pretty much staples. I also have a lot of Maria Denmark kimono tees which is a free pattern. In terms of dresses, emery, mortmain, anna and flora are all great for a full skirted shape. Or how about the new hepworth from sinbad and sailor? Love the pics of your MM wardrobe. I’ve yet to publish my pics *bad blogger* Looking forward to seeing everyone’s round-ups! I’m doing the challenge but have given up taking photos as I looked so boring! A post above mentioned the Maria of Denmark Kimono tee, I’ve made 3 of these and they are great basics to have. I have only made one Renfrew so far but have plans for more. You have a really lovely color palette going on here, and some great basics, I think! That plaid pencil skirt in particular is really lovely, and since the colors are so muted I think you could get away wearing it with any number of things! “Basic” but with a pop! Also is it odd to say I think you have really lovely hair?! I’m a curly girl, too, and I’ve always struggled a bit with my hair but I think this style really suits you! I’ve been having a lot of fun doing Me Made May this year, partly because I work from home now and have more time to choose and outfit and because I’m now on Instagram. It’s been really fun choosing my outfits and sharing them there. 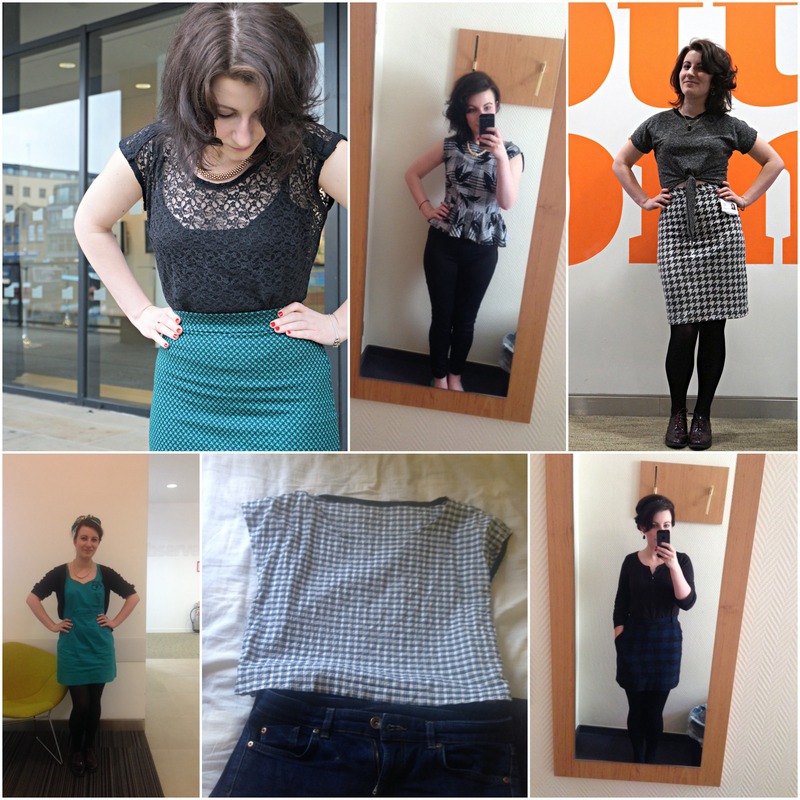 Great blog, I enjoy reading your new posts and your an inspiration to us fanatical dressmakers!